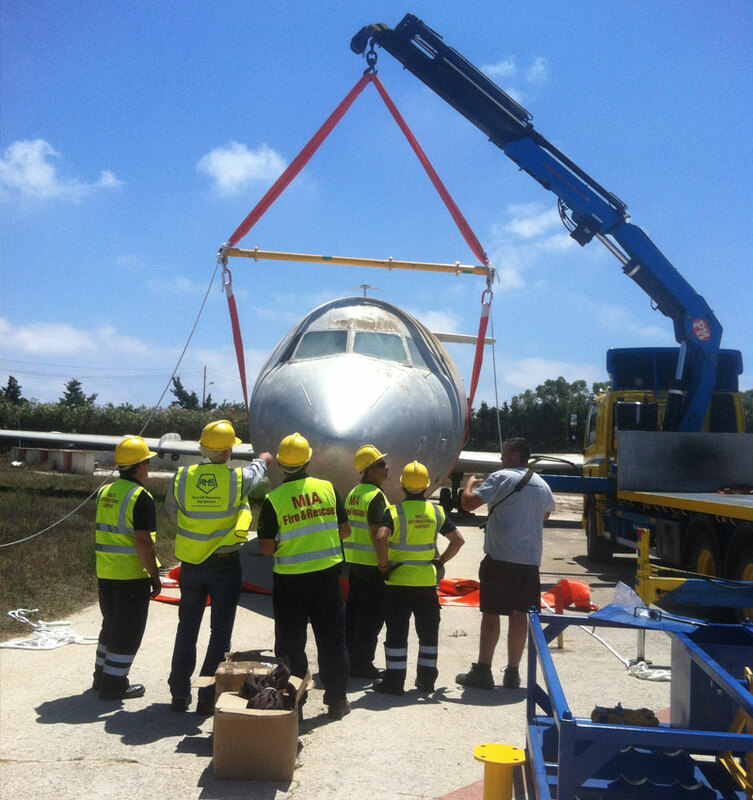 This summer Malta International Airport (MIA) purchased the AMS CAT1 Fuselage Lifting System (FLS) to enhance their aircraft recovery capability. Our CAT1 FLS provides the capability to lift either the nose or the rear of the aircraft fuselage, and was designed to satisfy the compliance requirements of both the Boeing and Airbus Aircraft Recovery Manuals. AMS’s FLS is a highly flexible modular system that can be fully upgraded to CAT2 and CAT3 requirements. It is air transportable and can be utilised on at least 12 of the most commonly used civilian aircraft in use today. With a span of 4.5 metres and maximum working load of 18 tonnes the assembly configurations are extremely comprehensive. Malta International Airport already has a selection of AMS Airbags, Inflation Consoles and 20 tonne De-bogging Kits at their disposal. The addition of the CAT1 Fuselage Lifting System enhances their recovery capability, so they can confidently offer a full aircraft lifting solution (should it be needed). A nose gear collapse is the most common aircraft incident to occur at airports and causes major disruption to aircraft operations if the runway or taxiway has to be closed. The knock-on effect for public relations and the airport’s business can be considerable (both immediate and long term). Rapid recovery is essential to protect the reputation, integrity and financial well-being of the airport concerned. Malta International have demonstrated their commitment to keeping the airport open and their reputation intact with the acquisition of AMS’s CAT1 FLS. In addition to the purchase of the CAT1 MIA personnel were provided with onsite training by AMS’s Training Team, ensuring all recovery personnel are familiar with the simple assembly procedure. AMS have produced industry leading Fuselage Lifting Systems since 2006; the same year we conducted the 1st CAT3 lift of a B747. We have gone on to supply six of the major IATP Pool Kit holders with CAT3 Fuselage Lifting Systems. The AMS Fuselage Lifting System is currently the most widely used aircraft recovery system on the market. AMS’s CAT1 provides airports with an affordable start-up solution for recovering aircraft. Combined with the flexibility to upgrade the modular system to cater for larger aircraft (as airports expand and increase aircraft capacity), it offers compelling reasons to purchase this industry leading fuselage lifting system. Website visitors can view a video of our FLS being used by clicking here. For more details on the FLS and AMS’s comprehensive range of aircraft recovery equipment please call us on +44 (O)20 3289 9320, or contact us using the form on our website.